From the time we were very little children, we probably really enjoyed having a helium balloon. It was a treasured item that we carried around with us and we were always just a little bit sad when they ended up losing helium and no longer floated. It was also sad if we happened to let the balloon go and we would watch it float away with tears in our eyes. When we get older, we likely also appreciate a good balloon. They are not only colorful and a lot of fun, they are quite festive for almost any occasion. People use them for everything from birthdays to weddings and even opening day at many sports events. On those occasions, we may also watch the balloons as they float away and in the back of our mind, we may be wondering what is going to happen to that balloon when it eventually runs out of helium. Of course, we then go about our normal day-to-day lives and we don’t really give much more thought to those balloons that were headed skyward after they were released. What many people don’t realize is that the balloons that are released into the sky are extremely harmful to the environment and that is particularly true when it comes to animals. In fact, you may be doing more damage than you could have ever imagined by simply being involved in a balloon release. Balloons Blow is an organization that is designed to “provide information to educate people about the destructive effects released balloons have on animals, people, and the environment, and strives to inspire and promote an eco-conscious lifestyle.” They recently released a photo guide that shows why balloons should never be released. This was posted to the Balloons Blow Facebook Page on March 29, 2017. They are trying to convince people in a small area not to allow international balloon releases. 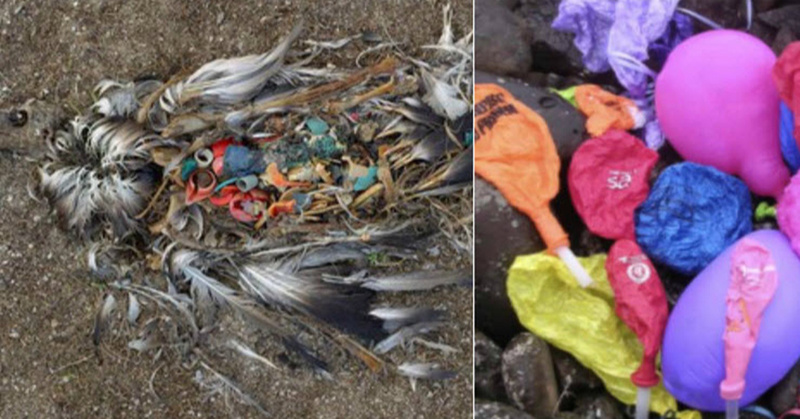 Many animals are unable to distinguish between food and litter so they may eat the balloons and it could hurt them. “When an animal swallows a balloon, it can block its intestinal tract, leading to starvation,” explains the photo. Once they popped or deflated, they are bleached by the sun and when they end up in the ocean, they look like a jellyfish. Sea turtles love to eat jellyfish. When the turtles eat the deflated balloons, it could harm them and even kill them. Releasing balloons may not seem like a big deal but it is no better than throwing trash out of our car window. It poses a serious risk to the wildlife on our planet. Balloons make the claim that they are biodegradable in some cases, but that process may still take years and chemicals are released into the environment as they degrade. Latex balloons can affect animals but even foil balloons can cause dangerous power outages or spark fires. First of all, don’t release balloons when you have them. Secondly, encourage businesses not to have a balloon release and third, choose an alternative, such as banners, bubbles or flags.